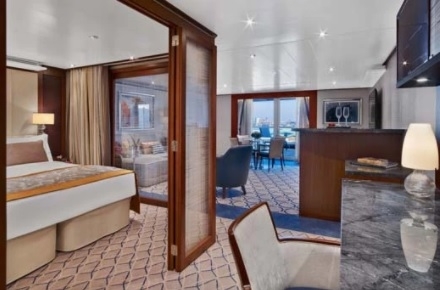 Experience the very latest in sophistication at sea aboard this small and elegant cruise ship. Encore’s magnificent interior and outdoor public spaces were created by award-winning hospitality designer Adam D. Tihany, with an outcome that he describes as being “imbued with a sense of spontaneity and exhilaration, to elicit surprise and delight that will complement the rest of the guests’ travel experiences.” As he so wisely says, each surprise cannot be described, only discovered. This exceptional 12-deck, 600-passenger luxury cruise ship debuted in December 2016. Modelled on the award-winning Odyssey-class vessels, Seabourn Encore offers a wealth of new concepts and illuminating ideas to delight the world’s most discerning travellers. This vessel exudes ultra-luxury, with design elements typically found on the most desirable private yachts. Those seeking high-comfort will be impressed with the high ratio of space per passenger and wonderfully attentive service. 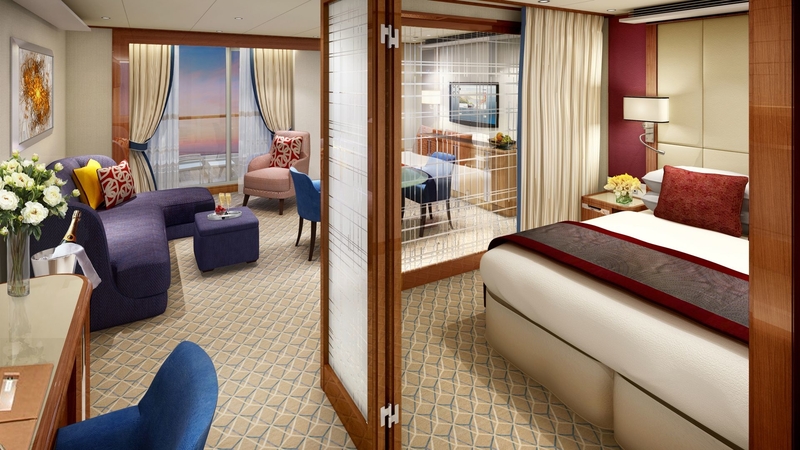 Each of the 300 glorious suites feature a private balcony and luxurious all-marble bathroom. Penthouse Suites offer guests the option to close off a glass wall to separate the bedroom from the living room area. The Owner's Suite features separate living and sleeping areas, with a dining table for four and an additional half bath for guests. The Signature Suite features dinner seating for up to six, a pantry with wet bar, forward-facing windows and a whirlpool bath. The Wintergarden Suite offers a glass-enclosed solarium with a tub and daybed. Guests are also afforded the luxury of dining choice aboard Seabourn Encore, with formal, casual, speciality, and al fresco venues to choose from. Savour the culinary delights served in The Restaurant, the main dining room for breakfast, lunch, and dinner. The Colonnade offers casual dining, with a mix of tempting buffet and al la carte dishes, whilst poolside The Patio caters for al fresco lunch and dinner times. Acclaimed chef Thomas Keller, best known for his Michelin-starred restaurants, has added a new signature restaurant to Encore; The Grill serves gourmet chophouse fare and includes an outdoor dining option. Speciality coffees, cakes, pastries, and gelato are available from Seabourn Square, or for something a little different, a dedicated sushi restaurant prepares fresh fish and rice dishes daily. A lavish red and blue colour scheme enhances the magnificence of The Grand Salon, the ship’s main show lounge. Allow yourself to be intrigued and entertained by guest speakers, classical musicians, comedians, cooking demonstrations, dancing, musical shows and cabaret performances. Debuting with Encore is a new production show, "An Evening with Tim Rice," which features film clips of the award-winning Broadway lyricist interspersed with concert-style performances of his popular songs, performed by the ship’s talented singers. Another elegant lounge is The Club on Deck 5, perfect for music, dancing, and socialising. The space houses a bar featuring custom-crafted cocktails and wine, as well as a casino with slot machines and tables for blackjack and roulette. This leads out to the Club Terrace, an al fresco space with a plunge pool, two whirlpools, illuminated fountains and deck service for ordering food and drink. The Observation Bar not only provides the best views of the ocean, but also features a central skylight with a stunning central design of a school of fish. A two-deck-high waterfall greets passengers at the entrance to the Spa at Seabourn, where a full range of spa and salon services and facilities enable full pampering and indulgence. Make the most of the Kneipp walk-in-the-water experience, thermal suite, hot tub and relaxation area during your days at sea, leaving you energised and ready to explore the beautiful destinations on your itinerary. For the first time on a Seabourn ship, the Spa and Wellness with Dr. Andrew Weil program offers guests classes in mindful living, such as complimentary and daily yoga and meditation sessions, as well as seminars on topics like healthy aging and anti-inflammatory foods. If you are feeling active, the gym features all the equipment you will need to work up a sweat, as well as personal-training sessions, yoga classes, Pilates and body composition analysis. If you’d rather take to the water, Encore features a water sports marina at the back of the ship offering complimentary use of kayaks, pedal boats and windsurfers. All Penthouse Suite feature separate bedroom. Glass door to veranda, two flat-screen TVs, fully stocked bar, spacious bathroom with tub, shower and large vanity.